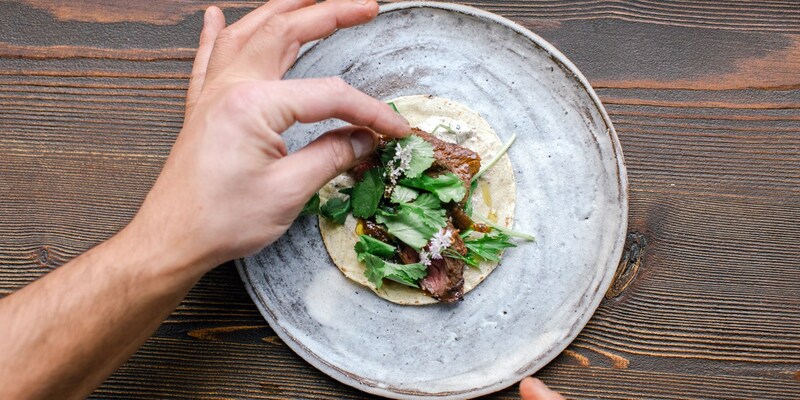 No one food has captured the hearts of British foodies in recent years like the taco has. The cornerstone of Mexican cuisine, these small tortillas – be they crunchy or soft – are much more than an edible, handheld plate; they are one of the most important aspects of Mexican culture. And if you think that's a bit of an overstatement, let our collection of taco recipes convince you otherwise. Our knowledge of Mexican flavours has progressed hugely, and we now know the Tex-Mex kits found in the supermarkets aren’t anything like what you’d find in the majority of Mexico. For something more authentic, try Salle Abé’s Easy fish tacos or Nud Dudhia’s Beef onglet taco with spring onion crema, morita salsa and coriander. Catering for a crowd? These Beef short rib birria tacos are just what you need, or if you’re looking for something a bit different at the weekend Paul Welburn’s Yorkshire Sunday roast tacos are perfect. Tacos are also the perfect vehicle for fusion food, as shown by these recipes for Za’atar-spiced lamb neck and baba ganoush tacos and Memphis pork tacos with slaw and barbecue sauce. When making tacos you can either buy ready-made tortillas or make your own with nothing more than masa harina (a type of ground maize), water and salt. Just be sure to warm ready-made ones before serving so they soften and bend without breaking.